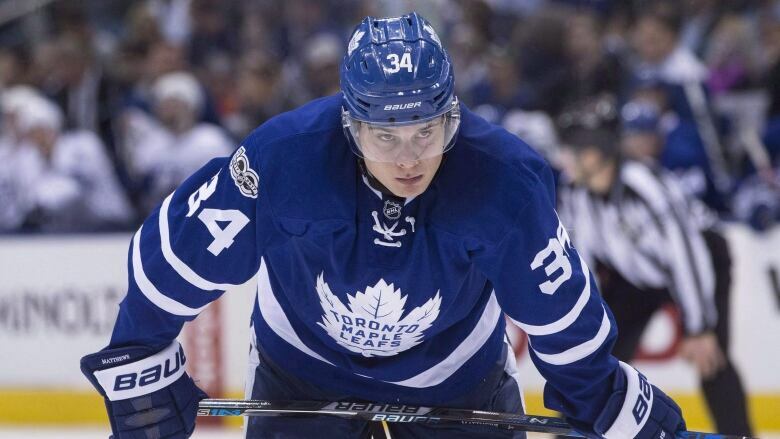 Toronto Maple Leafs forward Auston Matthews is listed as day-to-day with an upper-body ailment and will not be in the lineup when the Leafs host the Minnesota Wild on Wednesday. ​Toronto forward Auston Matthews will miss his first NHL game on Wednesday night when the Maple Leafs host the Minnesota Wild. Matthews is listed day-to-day with an upper-body injury after appearing to play in some discomfort earlier in the week. His status became questionable when he missed Tuesday's practice. The 20-year-old centre originally left Monday's game-day skate early but still suited up that night against the Vegas Golden Knights, picking up an assist in a 4-3 shootout win. Matthews has played in 98 straight regular-season games since Toronto drafted him first overall in 2016, including all 82 in his Calder Trophy winning campaign last year. He leads the team this season with 10 goals and 19 points in 16 games. Matthews was asked about his issue after Monday's win against Vegas and said what was bothering him at the time wasn't enough to keep him out of the lineup. "It's just a little bit of soreness. It was fine to play." said Matthews. "I think you never really feel 100 per cent. I felt good enough to play and felt good enough to be able to contribute." Leafs coach Mike Babcock said he plans to shift Patrick Marleau to centre to replace Matthews against the Wild. Toronto also recalled centre Frederik Gauthier from the American Hockey League's Toronto Marlies. "Obviously Auston's a very important piece of our puzzle and we'd like him to play as many games as possible but no matter who is in or out, I think we have guys to fill the void and certain guys are just going to have to step up," Leafs forward Nazem Kadri said after Wednesday's game-day skate.